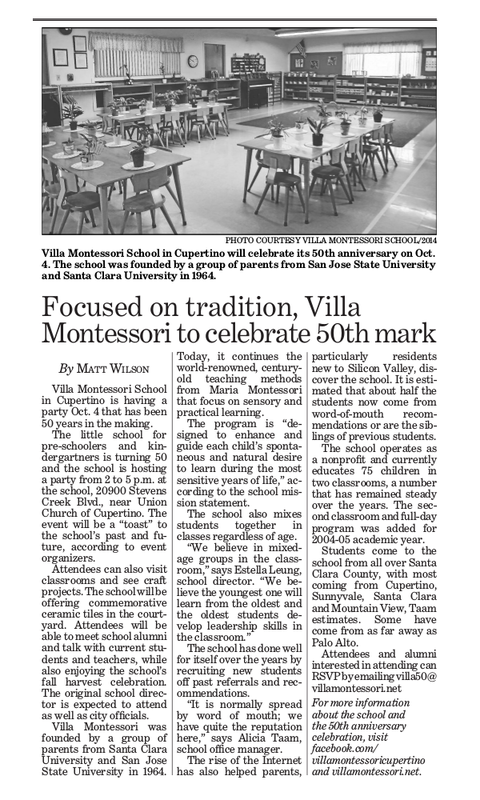 Villa Montessori School in Cupertino is having a party Oct.4 that has been 50 years in the making. The little school for preschoolers and kindergartners is turning 50 and the school is hosting a party from 2 to 5 p.m. at the school, 20900 Stevens Creek Blvd., near Union Church of Cupertino. The event will be a “toast” to the school’s past and future, according to event organizers. Attendees can also visit classrooms and see craft projects. The school will be offering commemorative ceramic tiles in the courtyard. Attendees will be able to meet school alumni and talk with current students and teachers, while also enjoying the school’s fall harvest celebration. The original school director is expected to attend as well as city officials. Villa Montessori was founded by a group of parents from Santa Clara University and San Jose State University in 1964. Today, it continues the world-renowned, century-old teaching methods from Maria Montessori that focus on sensory and practical learning. The program is “designed to enhance and guide each child’s spontaneous and natural desire to learn during the most sensitive years of life,” according to the school mission statement. The school has done well for itself over the years by recruiting new students off past referrals and recommendations. “It is normally spread by word of mouth; we have quite the reputation here,” says Alicia Taam, school office manager. The rise of the Internet has also helped parents, particularly residents new to Silicon Valley, discover the school. It is estimated that about half the students now come from word-of-mouth recommendations or are the siblings of previous students. The school operates as a non-profit and currently educates 75 children in two classrooms, a number that has remained steady over the years. The second classroom and full-day program was added for 2004-05 academic year. Students come to the school from all over Santa Clara County, with most coming from Cupertino, Sunnyvale, Santa Clara and Mountain View, Taam estimates. Some have come from as far away as Palo Alto. Attendees and alumni interested in attending can RSVP by emailing villa50@villamontessori.net. For more information about the school and the 50th anniversary celebration, visit www.facebook.com/villamontessoricupertino and www.villamontessori.net. In Cupertino, where education is paramount, Villa Montessori School is one of the city's oldest preschools. On June 4, the staff, students and alumni of the red-roofed, rectangular school on Stevens Creek Boulevard celebrated its 40th anniversary. Villa Montessori is parent-operated, nonsectarian and nonprofit. Its focus is students with a well-rounded education, ranging from mathematics to language arts and including music and coordination. Central to its philosophy is that children learn to be self-directed and responsible. The Montessori method of teaching began in early 1900s when Dr. Maria Montessori, the first woman to practice medicine in Italy, proposed universal laws of development inherent to children of all races and cultures. She believed education was a means for creating a better society. Today, there are Montessori schools worldwide. Currently, summer school is in session at Villa for 3- to 5-year-olds in the morning and 4- to 6-year-olds in the afternoon. While munching on saltine crackers and cranberries, one 3-year-old boy expressed his enthusiasm for his favorite classroom activity. "I like playing with the animals," he said with a huge grin, pointing to a box full of plastic jungle animal figures. "I like the lions and the tigers the best." Though the school relies on word-of-mouth to attract applicants, its 60 spots are always in high demand. Students are admitted on a first-come first-serve basis, and there is usually a waiting list. "We always have the best of the best. All of our teachers are Montessori-certified, and all have a bachelors of science in early childhood education," says Mirjana Krtolica , director of the school. Teachers, it seems, also win the confidence of their young students. "I love my teacher. She tells me how to count. She tells me how I can sing and dance. She knows how to...um...she knows everything!" one 5-year-old girl said. Over the past 40 years, Villa Montessori has undergone some fundamental changes, such as a growth in the number of students and a more advanced academic curriculum, especially in math and science, with interactive classroom activities. The school's basic values, however, have remained unchanged. For example, the education of students in basic life skills such as interacting well with other students and respect for others is equally as important as academics. During a morning class, two boys sit on the floor. They fit colorful blocks carved in the shapes of the seven continents into their corresponding holes on a flat wooden map. "That's Africa!" announced one of the four-year-olds. "This one is Asia!" one boy said, helping his classmates fill in the missing piece. Alicia Taam, administrative assistant of the school and a parent, emphasizes that skills taught in the classroom are closely tied to those used at home. The students, for example, are taught how to wash dishes, hang their jackets and do other chores normally done for them at home. "Children are taught to use household items in the classroom. We also emphasize the completion of the whole process. You take something out, you put it away; you start something, you finish it," Taam says. The children are not the only ones learning Montessori values . "We educate the parents also. This is probably the hardest part. We teach them ways to discipline the children at home," Krtolica says. She says the Montessori school environment is an extension of the home environment. "Everything really starts from the home." One of the school's main focuses is to maintain consistency when it comes to expectations and creation of a daily routine. "We set the tone on the first day, and it continues until the very last day," Taam says. This includes the school's emphasis on independence and self-directed achievements. "The children choose what to do every day, and the teachers are there to guide them," Krtolica says. One five-year-old girl demonstrates this philosophy when she takes her teacher by the hand and says, "Now I want to play music!" The girl heads for a corner of the room and begins to chime a row of bells set up to include a variety of musical notes. The teacher encourages her. "See, you can make music too. Fantastic." The Villa, unlike most other schools, does not separate students based on age. This class structure nurtures the school's emphasis on leadership. "The older children are the leaders in the classroom. The younger children look up to the older ones. They learn from the older students, and then they try to become one of them,"Krtolica says. The school encourages parents to read the recently published book Montessori-the Science Behind the Genius by Angeline Stoll Lillard , which explains philosophy behind Montessori schools. The 40th anniversary in June was the first such celebration for the school. But it was a big one, also recognized by some dignitaries-- Cupertino Mayor Patrick Kwok, as well as Senators Barbara Boxer and Diane Feinstein offered their congratulations. "It was really exciting," Krtolica says. "We wanted to let the world know that after 40 years, we're still around; it's a milestone."